Week two is done and dusted, and I’m more confident than ever that I’ve found the career I always wanted. I summarised my week to a friend via text message today and it went as follows ‘Honestly I have no idea where to start…’. That’s still very much the feeling, but apart from a sweetcorn related occurrence (I will leave that one to your imagination), one thing particularly stood out for me that I experienced this week. On Wednesday there was a slight issue with coverage of all the tasks that needed to happen, and one of them was completing the pathologist’s notes while she conducted the post-mortems. Before I really thought about it I heard myself say ‘Would I be able to do the Doctor’s notes?’, to which the APTs both said ‘Sure!’. So that’s how I found myself in the viewing gallery above the metal workbench where the pathologist was conducting the post-mortems of four individuals. This process is really interesting. The APT is there to complete the evisceration of the patient, in other words remove all the organs. Then the pathologist looks at these organs, provides a cause of death if one can be ascertained and then the APT puts the organs back in the patient and stitches them up. That’s a very basic run through, there’s a lot more involved but that’s for another day. My role on Wednesday was to write down all the notes the pathologist needed for each patient so she could put together her final notes after. I was provided with an A4 sheet for each patient which was already filled out with their external remarks and details; all I had to do was note down what the doctor said about each organ or body part and the weight measurements she took. 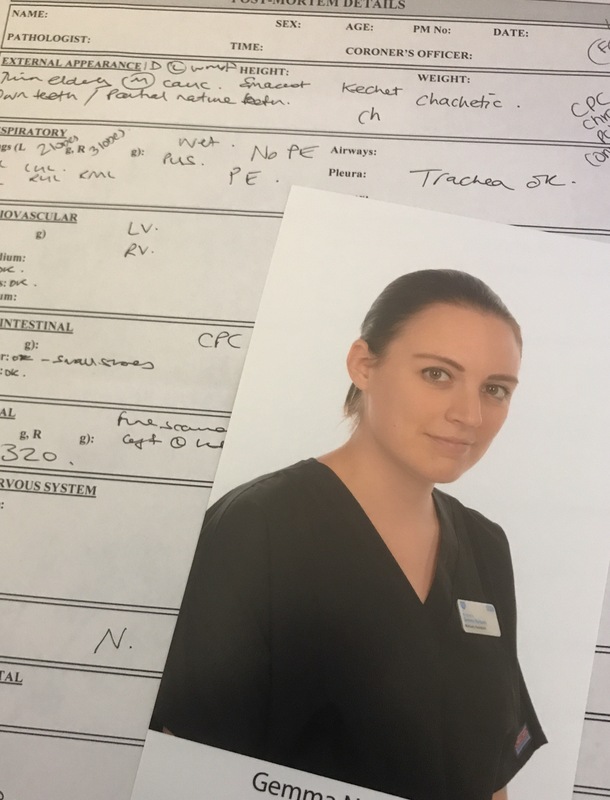 Lucky for me the pathologist made this a very painless and enjoyable process, showing me in detail why she was saying each note and also pointing out to me where I should be writing things if I couldn’t find them on the sheet! I found it fascinating and so exciting, I could feel myself leaning further and further forward on the side of the gallery to get a better look at what she was doing. It helped she also kindly spelled out any of the longer medical terms I wasn’t familiar with, and I was pleasantly surprised that even something could gross her out- she really doesn’t like pus. Afterwards I took my notes, once one of the APTs had photocopied them for our records, and gave them back to the doctor for her to write up her findings. I was sillily chuffed to bits that she complimented my handwriting! Two things I will remember clearly from this experience (other than the above), firstly that sometimes when she found a possibly cause of death she would exhibit the dark humour I am becoming accustomed to in this situation and say something like ‘Oh there is a heart to die for!’. Secondly, one particular liver caused a lively discussion about how terrible the foie gras production business is. Amazing. The photo below has an example of one of these sheets, all the scribbling on this is my practice beforehand and a colleague showing me how it works, it does not relate to any patient at all. The photograph of me overlaying the sheet is one taken for a poster showing all the mortuary staff. I think I look a bit scary and quite orange, but I’ve certainly looked worse. Funnily I look a lot worse on my actual staff pass where somehow I’m not even looking at the camera. One last thing for this week, I had my flu jab on Thursday as I do every year (although working in a hospital they give you free stuff which is always nice, you know my love of free stuff knows no bounds) and I would like to encourage you to do the same if you would like to. It’s important to curb the spread of the flu each year as it can seriously impact the elderly and the young, or people with medical conditions. You can really help, and I think a lot of the time you can get it for free or for a small fee. That’s all for this week, comment, like and share if you fancy doing any of that as always. Feel free to ask questions and have a great weekend.